As a Master Life & Equus Coach and the founder of The Truth Experience, Jennifer Voss helps others reinvent pieces of their personal and professional lives that are unhealthy or outdated. Before becoming certified as a Martha Beck Master Coach, she earned an MBA from The University of Alabama and spent 20+ years in various business ventures – ranging from owning an independent bookstore to holding an executive role within a national distribution company. 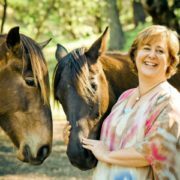 She loves blending her business background with the magic of equine coaching to help others connect with the heart and soul of their real work in the world. Her favorite part is nailing down a vision and watching a dream come to life in a playful and healthy manner. Jennifer believes that the most efficient and effective way to do that is to connect with nature and with others who share the same vision—with those who lift us up and make the game of business and life a fun, profitable and sustainable one to play. Jennifer lives in Knoxville, TN, has two children, two dogs, and dreams of having a horse ranch someday.